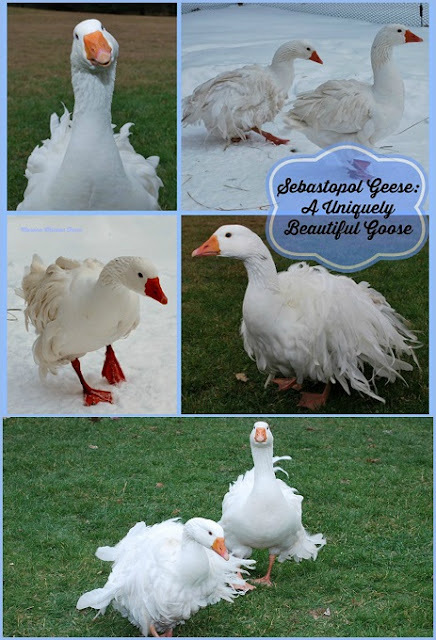 Sebastopol Geese: a goose in a dress! Meet Donald and Ivana (named years before the presidential issues of today) These are my Sebastopol geese and wow, what a pair they are! Sweet tempered, affectionate and friendly, they are the most awesome geese I have ever known! I first heard about Sebastopol Geese about 7 years ago. I saw a picture of them and thought they looked just like they were wearing party dresses! I just had to have some but the price was daunting. Fortunately I was gifted a pair about a year later. I fell madly in love with their personalities as they are some of the sweetest waterfowl I have had. They are the only breed of goose that I have raised though, so maybe all geese are this personable? Sebastopol geese are descended from the European Graylag and were first exhibited in England in 1860. They are named after the Russian city of Sebastopol and were first recognized by the American Poultry Association in 1938. They have long, white curly feathers with a flexible quill. The feathers on the neck are smooth (though they fluff up kind of funny when wet!) and the breast can either have smooth or curly feathers. While most typically white, they also come in buff, gray and saddle back colors. It's not uncommon to have a random gray feather here or there on an otherwise all white goose. The female produces a few dozen eggs per year, mainly in spring and summer. Their bills, legs and feet are orange. Their eyes are the most brilliant blue you will ever see! They are just beautiful to look at! Because of their feathers, the Sebastopol is a flightless goose. They love to swim and even though their feathers have a tendency to pick up dirt and debris, with access to fresh water they keep themselves remarkably clean. As far as geese go, Sebbies are probably the most expensive with prices for show quality breeding pairs easily hitting $300. I happen to have 1 smooth breasted and 1 curly breasted goose. I have not bred this pair, but I understand that their eggs are often difficult to hatch. Our pair of geese have grown quite attached to us and will often follow us around all day long in the yard. They sit on the outside of the garden fence and wait for me while I'm gardening often sneaking inside to sit by me if they can. They are not terribly destructive to the garden though they can reduce a clear puddle to a mud pit in mere seconds! They aren't as messy as my ducks when drinking water though they do splash around a bit. They love swimming (of course) and ours get quite perplexed in winter often honking at the ice on the pond when it's solid and they can't swim. They are also quite intelligent and I often find them sitting under the clothes dryer vent on cold days, waiting for it to turn on! They are cold hardy but I'm very careful to keep their coop draft free since their unique feathers don't keep them as warm as regular goose feathers would. They do take a little extra care and those feathers end up absolutely everywhere! The extra work is worth it though as you won't find a fancier dressed goose then the Sebastopol!